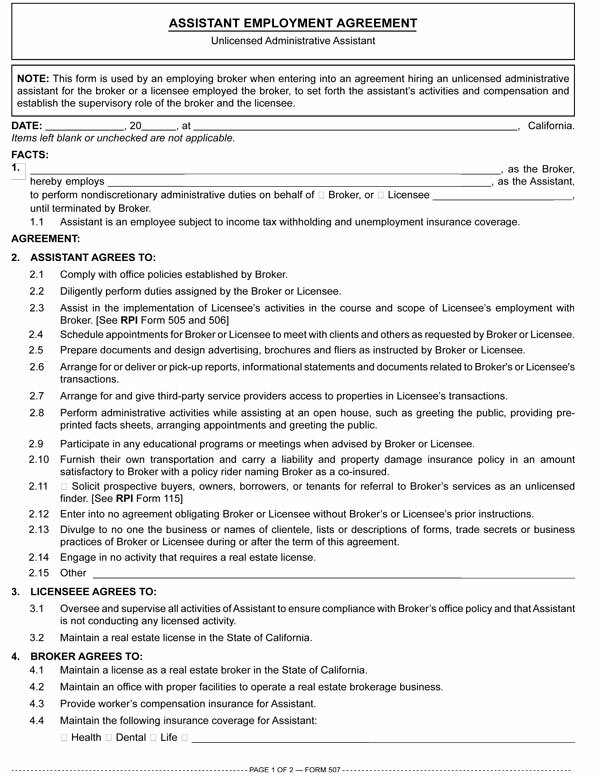 This form is used by an employing broker when entering into an agreement hiring an unlicensed administrative assistant for the broker or a licensee employed the broker, to set forth the assistant’s activities and compensation and establish the supervisory role of the broker and the licensee. Any unlicensed person may solicit prospective buyers, sellers, borrowers, tenants or landlords for referral to brokers, agents or principals as an unlicensed finder employed by the broker working in exchange for the promise of a fee. be employed by either principals or brokers. All employees of a broker must be hired under written contracts of employment. This includes licensed agents, administrative staff and finders. Written contracts are entered into to delineate the responsibilities each has undertaken. Provisions limit their conduct to what regulations allow for their licensed or unlicensed status. [See RPI Form 115, 505, 506 and 510]. Generally, a finder’s fee is a lump sum amount or a percentage of the fee received by the broker on a transaction which is closed due to the finder’s referral. Only sound economics control the amount of the fee a broker, agent or principal should pay a finder for a lead. Also, no limit is placed on the volume of referral business conducted by a finder. discuss amenity features of the property (e.g. neighborhood, schools, etc.). Unlicensed assistants may arrange and schedule appointments for agents to meet with principals or members of the public relating to an existing or potential real estate transaction. They may also arrange appointments for services to be provided by third parties, such as pest control companies or appraisers, relating to a transaction. However, when making appointments, the may not discuss details related to the transaction or conditions of the property.